In my past couple of articles looking at the differences between wired and wireless networking, we’ve looked at the fact that Wi-Fi is a half duplex medium and that it is also a contended medium. 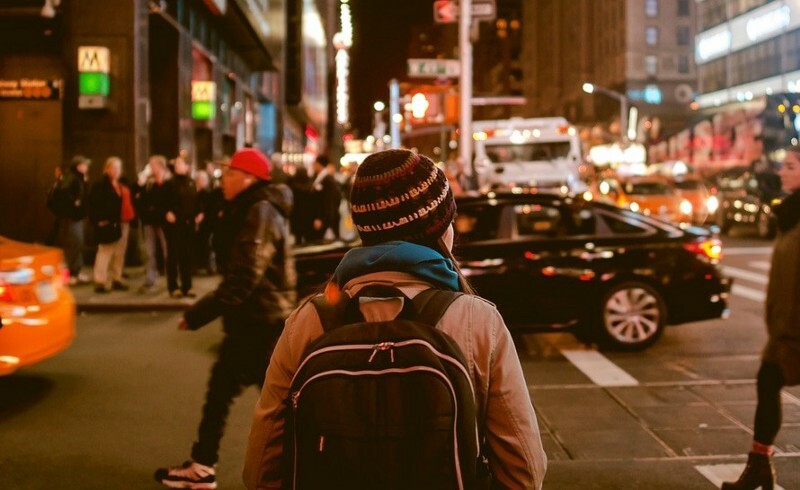 Although Wi-Fi is a fabulously convenient network access method, understanding some of its technical limitations will help you get the best out of your Wi-Fi network. There is another nuance of Wi-Fi networking, which is related to the contended nature of access to the RF medium. As devices using Wi-Fi have to take turns to send their data, there is an additional effect caused by the varying capabilities of the devices using network. Different Wi-Fi devices have varying capabilities depending on when they were manufactured and the components used to construct them. Some may have the “latest and greatest” super-fast wireless cards, whereas others may be a few years older and may not have speed capabilities of newer equipment. Even the “latest and greatest” Wi-Fi equipment may have different performance characteristics dues to differences in numbers of antennas, antenna size, power availability and chip-set capabilities. The best analogy to understand this subtlety of Wi-Fi networking is to think back to our example of a single lane highway from part one of this series. 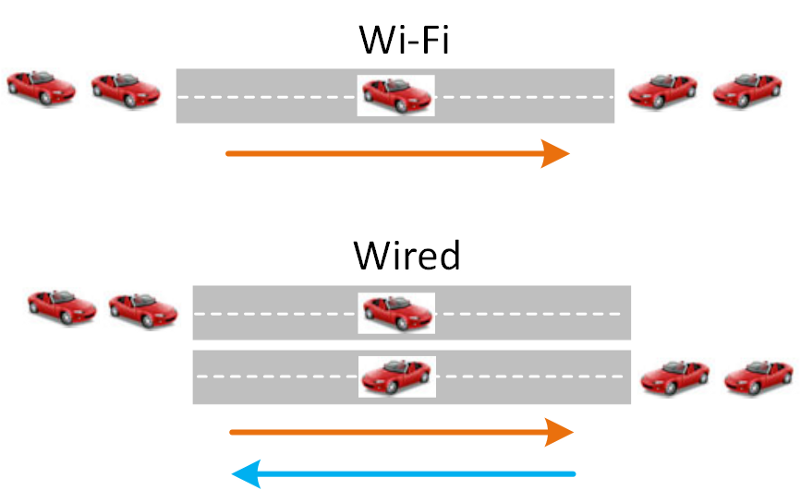 We discussed how only one vehicle can travel in each direction at any time, in the same way that half-duplex Wi-Fi connections operate. We can extend this analogy a little further and consider the impact if we have a mix of vehicle types. 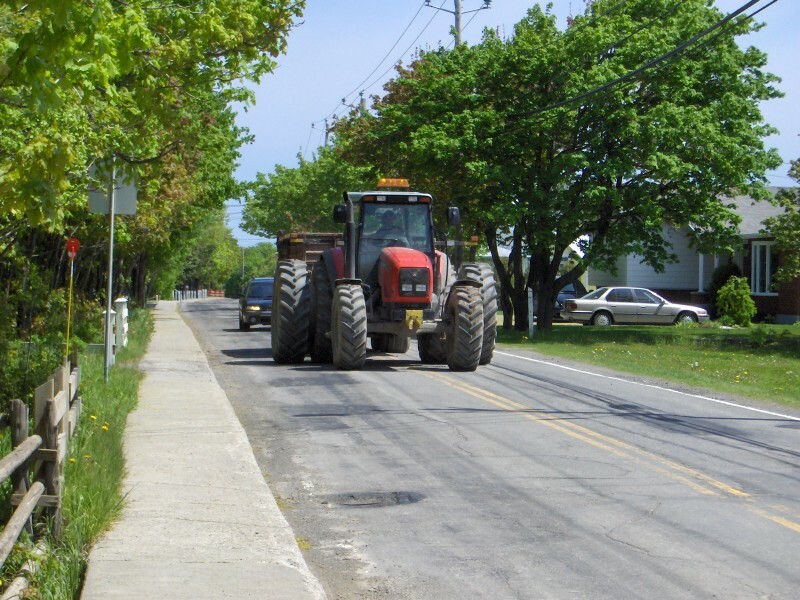 Instead of having only fast vehicles using our road, we may have a mix of sports cars, family saloons, trucks, farm tractors and bicycles. 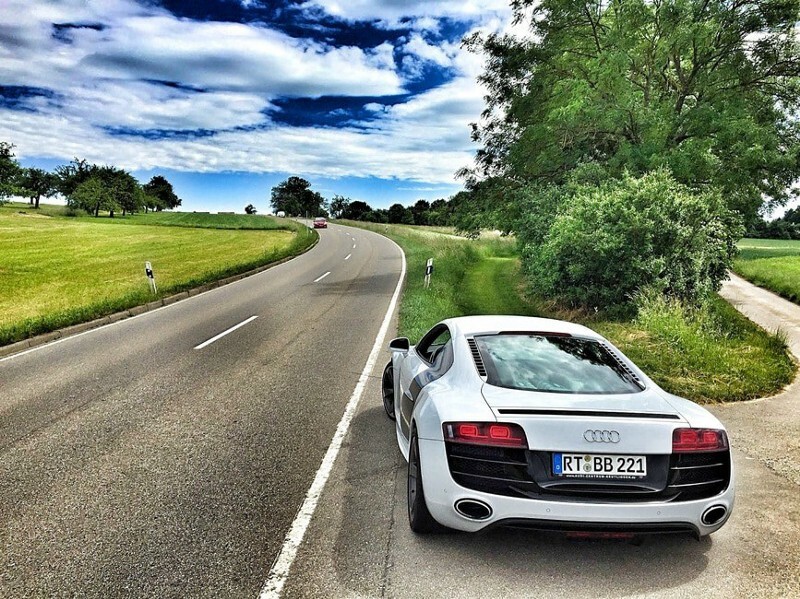 When sports cars are using the highway, they use the road at high speed and quickly complete their journey to make it available for other vehicles to use. But, when a bicycle decides to use the highway, it takes a lot longer to travel along its length. This means that all of the other vehicles (even the fast ones) are waiting longer to use the highway again. We have exactly the same issue with Wi-Fi networks. Devices which are “less capable” and connect at lower speeds will have an impact on faster devices that need to use the network. When a slower device sends its data, as it uses a slower connection speed, it will take longer to send its data than a faster device. As we add more slower devices that need to send data, then the more impact they will have on the faster devices that have to wait longer for their turn to use the RF medium and send their data. The best solution is to ensure that our Wi-Fi is correctly designed to be as efficient as possible. If we ensure that all devices can operate at their highest possible speeds, we will at least ensure that we gain the maximum possible throughput available from all devices. This will maximize the air-time (i.e. throughout) available to all clients. A good RF design for your Wi-Fi network is critical — get an expert to design your Wi-Fi RF environment. Another approach is to consider upgrading the devices that use the Wi-Fi network. This is a particularly important consideration if your wireless network is mission critical and provides the primary access method to your wired network. If you have any 802.11b, 802.11g or 802.11a devices on your network, seriously consider replacing them with 802.11n or 802.11ac devices. Another useful approach is to relegate slower, legacy devices to the less-desirable 2.4Ghz band. By creating an SSID that is specific to only 2.4GHz and getting slower devices to use only that SSID, you can keep the higher performance 5GHz band for your higher-spec, mission critical devices. This approach obviously depends on the requirements of your particular network, but can be useful in some scenarios. How Fast Is My WiFi Client? As discussed in my last article, when deploying Wi-Fi networks there are a number of considerations around wireless connectivity that we need to be aware of when comparing them to the more familiar world of wired networking. In this article we’re going to look at another of Wi-Fi’s “guilty secrets” that few people seem to be aware of. Are you ready for it..? What does this mean? All devices connected to each wireless access point (think of laptops, iPads, smartphones etc.) have to take turns to transmit and receive data. They have to share access to the access point. This means that as more devices that join an access point and have data to send, the longer each device may have to wait before it can send its data. Wi-Fi is a “contended” medium: everyone using it has to take their turn to “talk” to the wireless access point. When things start to get busy on your Wi-Fi network, this can be a significant challenge. Why is this an issue compared to wired (think Ethernet) networks? Well, each device connected to an Ethernet switch has its own dedicated chunk of network access bandwidth. If an Ethernet station is connected to a 1Gbps port, then it has a full 1Gbps available and does not share it with anyone else. Each device connected to an Ethernet switch port gets its own 1Gbps of access bandwidth to use. In a Wi-Fi network, if we have a single device connected to an AP, it has access to the full bandwidth that the AP makes available. If we add a second device, the bandwidth available is now shared between both devices (50% bandwidth each) as they take turns to send data. If we add a third device to the AP, each device now has access to 33% of the bandwidth as three devices now take turns to send data. As more devices are added to an AP, the opportunities for each one to send data will decrease, reducing the bandwidth available to each one. 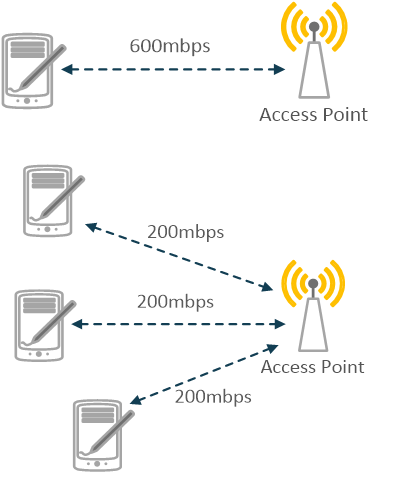 The contention to access the wireless network described above applies only if multiple devices need to send data at similar times. However, if wireless forms a significant part of the access layer of your network, this will very likely become an issue very quickly as the number of users (who may have several Wi-Fi devices each) increases. How do we mitigate the limitations of Wi-Fi’s contended access method? We must optimize our wireless design to achieve the maximum throughput available. This is achieved by designing each Wi-Fi network for capacity as well as wireless coverage. Careful design & planning of the wireless RF environment, together with taking account of client & application bandwidth requirements is the only way to ensure optimized performance. No matter how many gazillions of dollars, pounds, euros or <insert your currency here> you spend on your Wi-Fi network, it is subject to the same immutable laws of physics as everyone else’s. This applies to home networks, mid-sized and even large Enterprise Wi-Fi networks. Wi-Fi has a number of inherent limitations, compared to wired networks, that are (currently) insurmountable and limit the data throughput that can be achieved. Wi-Fi networks generally achieve a fraction of the throughout that you would expect from a modern switched, wired network. Unless you understand these limitations and design with them in mind, your wireless users are likely to have a poor experience. The first limitation of Wi-Fi networks that we’ll look at is the fact that it uses a “half duplex” medium. This means that if your iPad, iPhone, Android tablet, laptop (in fact any client device using a Wi-Fi connection) is exchanging data with a wireless access point (AP), data flows in only one direction at any time. Data frames can flow from the AP to the client device, or vice versa, but never in both directions at the same time. This limitation is due to the fact that the wireless AP and associated clients all use the same channel to communicate, meaning that they can only be transmitting or receiving. This contrasts sharply with wired networks, where full duplex is the general default mode of operation. This means that a device connected to an Ethernet switch port may have data frames flowing simultaneously in both directions. This effectively provides twice the available throughput for an Ethernet connected device, compared to a Wi-Fi connected device with a similar connection speed. How does this translate in to the real world? If we consider a wired device connected to a 1Gbps Ethernet switch port, it can realize a data throughput of close to 1Gbps connection speed, if required. If we have a Wi-Fi client connected to an AP using 802.11ac at a physical connection speed of 1.3Gbps, we’re likely to achieve an actual data throughput of around half the connection speed (approx 700Mbps), due to the half duplex nature of its connection. Unfortunately, Wi-Fi clients that can connect at 1.3Gbps are in the minority, with many 802.11ac mobile clients only able to support lower speeds. Also, there are still many legacy, lower-speed, devices that may be in use on your Wi-Fi network which provide even worse performance. Even if you are happy with your 700Mbps throughput, there are more factors to consider which mean that even this level of performance is a pipe-dream in the real world. We’ll look at more of these in future posts. How do we mitigate the limitations of Wi-Fi throughput? We can’t. What we must do is optimize our wireless design to achieve the maximum throughput available. Careful design and planning of the wireless RF environment is the only way to ensure optimized performance.